The Reef Islands, also called Rowa ('ro-wa'), are a cluster of coral cays between Mota Lave and Ureparapara, in northern Vanuatu. These low-lying islands have been uninhabited since 1939, when the people left after a severe tropical cyclone. The kastom landowners now live on Ureparapara, Vanua Lava and Mota Lava. 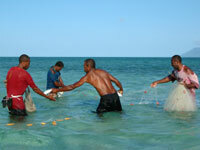 Visitors to the Reef Islands are people from nearby islands on fishing trips and sometimes cruising yachts. 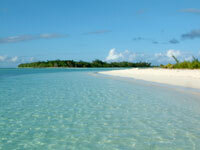 The Reef Islands are enclosed by a large, horseshoe-shaped reef that protects an expansive lagoon with sandy shallows. The five small islands are mostly sand built up over reefs and at low tide you can walk between the islands. To the northwest is a large break in the reef and an anchorage. 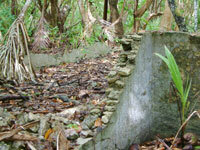 On Rowa island there is much evidence of village gardens with stone walls, breadfruit trees and bananas. 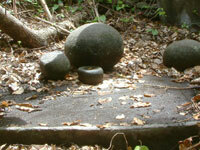 There are also some black stones which must have been imported from neighbouring, volcanic islands. Some of these are flat with many grooves and were apparently used for making shell money. Anwet island is a favourite spot for beachcombing and some people call it 'China Town' because you can find many things there. Enwot island is covered in low scrub and has the ruins of the old village. There are brackish ponds on Enwot. Early inhabitants probably dug wells and found potable ground water. Today, visitors bring their own drinking water. As a backup, there are coconuts. Wotansa island is drier and there's a camp site at the northern tip. Lavap, the smallest island, looks like a sparsely vegetated sandbar. Uninhabited and remote, the Reef Islands are vulnerable to exploitation. It is said that all of the sea cucumbers (beche le mer) were harvested by Asians in the 1980s. Also, shark-finning has greatly reduced numbers of sharks. Today, most people visit for simply for recreation and fishing. Sea Mullet are plentiful and the locals always bring a net. Visiting the Reef Islands is an expedition. You need a boat, camping equipment, food and water. The best place to find a speedboat is on Mota Lava. It's not likely that land owners living on Vanua Lava and Ureparapara see any of the 5000 Vatu fee! Under perfect conditions, it only takes one hour by speedboat from Mota Lava to the Reef Islands. In a choppy sea the crossing can take up to 2 hours. If winds are strong you should wait for calmer weather although the local speedboat Captains are fearless. Locals don't mind camping a few days, beachcombing and fishing and you usually would not pay any daily compensation. First surveyed: October 2005 by Stephen. Last updated: October 2012 by Steve and Pip.